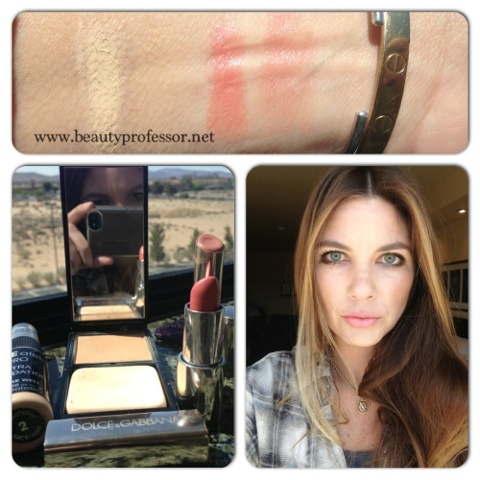 Beauty Professor: Return from Death Valley! 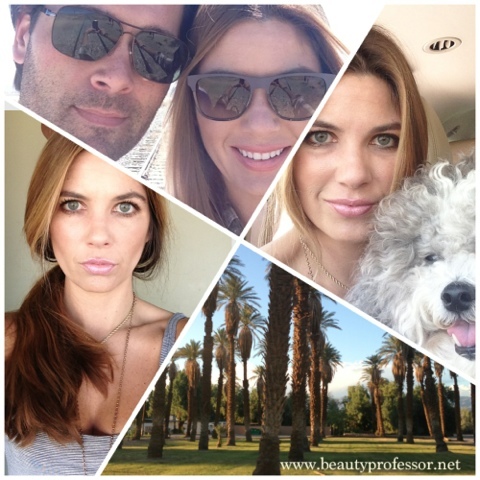 Above: My husband and me, Jethro and me, a serene date palm grove at Furnace Creek and a quick FOTD shot before heading to the sand dunes. This week, I spent some much needed time away from my normal Southern CA locale. Between an insane work schedule and a pernicious attachment to my laptop, a few days in Death Valley was a welcome respite to my hectic existence. After sending a litany of emails, prepping some Beauty Professor auto posts, and packing enough clothes and makeup for a three week--rather than three day--excursion (hey, a girl needs options! ), we hit the road for the desert. Despite the rather macabre name, Death Valley boasts a variety of impressive claims and natural wonders including being the lowest point in North America, the hottest place in America (134 degrees...it only gets anywhere near this scorching in the dead of summer), Titus Canyon, Artist's Palette, Devil's Golf Course, salt flats, monumental sand dunes, haunting ghost towns and exactly two hotels (Furnace Creek and Stovepipe Wells). Oh, and it might be important to note that there is little to no phone and Internet signal throughout the expanse of the valley...additionally, our room at Stovepipe Wells didn't have either a telephone or a television; this situation was charmingly rustic and allowed me to do some serious reading (got to love quality time with Coco Chanel)! 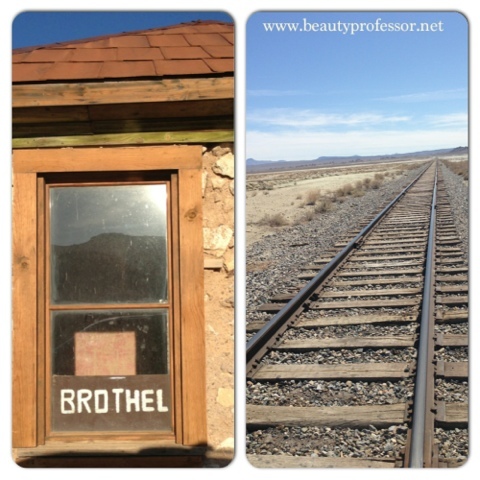 Above: I couldn't help but juxtapose the lipsticks I happened to have on hand (yes, I may have a problem) with this antediluvian train track in the middle of nowhere. 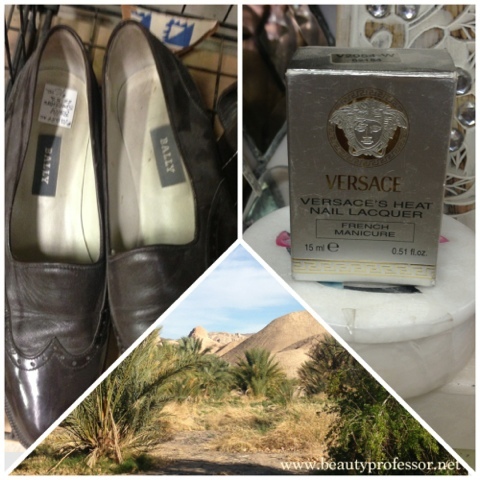 Even the desert needs By Terry, Tom Ford, Dolce & Gabbana and Sensai! Above: A FOTD featuring Face Atelier Pro Finish Foundation, Serge Lutens Teint Si Fin in O40, Dolce & Gabbana Passion Duo Lipstick in Imperial and By Terry lip color in Love Me Tender. The dry desert air was no match for this arsenal of products, which lasted a full 12 hours! Above: Even though the shopping was virtually non-existent, I was impressed to stumble upon these vintage Bally loafers...too large ; ( and some Versace nail polish (which had to be at least a decade old). I remember buying Versace makeup when it debuted in the early 2000's and wish it was still available in the US. I inexplicably found both of these items at the shop in China Ranch, an uber-remote date farm. Above: Desert sightings...this brothel structure is in Rhyolite, a ghost town that fizzled by the turn of the century....if only those walls could talk. The "train tracks to nowhere," discovered while en-route to the Trona Peaks. 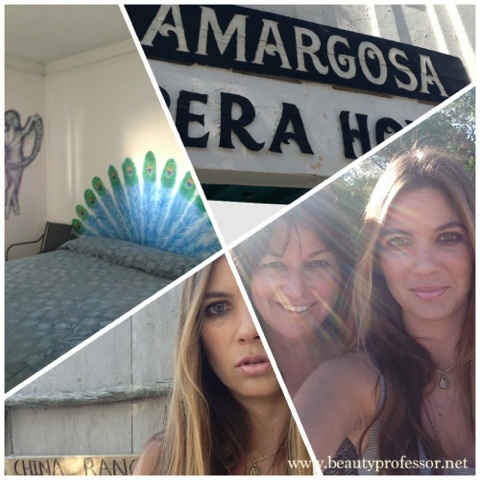 Above: Our last stop of the trip was the famed Amargosa Opera House and Hotel, which was singlehandedly restored by Marta Becket in the late 1960's. This is WELL off of the beaten track and infinitely intriguing...the hotel rooms have definitely seen some life since the early mining days (and are all decorated with murals by Becket) and the nearest gas station is over 30 miles away. So happy to have taken this trip with my husband and family (that's my mom and me in the lower right corner!). Sometimes an authentic getaway is in order...one that challenges the daily routine, requisite creature comforts and over-reliance on technology. My stint in Death Valley did just that...not only was it a beautiful departure from my everyday existence, it also made my return home that much more wonderful. I am able to personally confirm this reality as I type this post on my laptop, with Judge Judy on in the background (that woman is so fair), while lounging on my bed...ahh, the irony! What springtime trips have you taken lately? Thanks, Betzy...it was truly a fun few days! Hope all is well with you! Thank you so much, She's Chic...my family is absolutely wonderful...so blessed! A trip to NYC...how exciting...I'm envious ; ) I completely understand the insurmountable task of discerning "essentials" from "mere options"...haven't mastered it yet! I wish you the best in your travels; have a fantastic time and let me know how it goes! Thank you, Lynn! The desert is such a strange and magical place...so glad you enjoyed my post.